These days, it is really difficult to have mommy's home cooked food. As she ages, cooking for the family takes a toll on her health. Thus, our gathering are normally pot luck style or store bought. Well, she deserves a break. After all, she has been cooking for the family for 30 years or so. Of course, my kids misses her home made soup but I am now trying to live up to that expectation. Still have lots to improve on though. Call me a slow learner, as I started cooking seriously once I become a home maker and to date, I still have not master that 够火 taste. Anyway, enough of that soup talk. Besides making soup, mom excel in cooking and baking too. There are so many dishes that cling onto my childhood memories. One of them is Stir fry pork with salted vegetable. A simple dish but yet so satisfying. Even my help who doesn't take leftover kept it for herself the next day. Soaked salted vegetable to the level of saltiness that you like. For me, I soak it for 2 - 3 hours. Squeeze dry. Cut into strip. 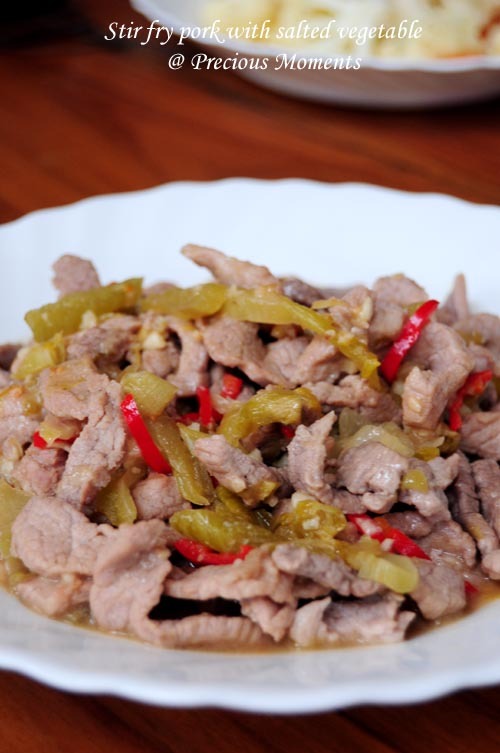 Marinate pork with soya sauce, sesame oil, pepper and corn flour. Heat up wok till hot, put in salted vegetable and dry fry for a min or two. Remove. Add oil and stir fry garlic till fragrant. Add in pork and stir fry. Add in salted vegetable and mixed well. Add a little water and bring to a boil. Edith, love this homey dish. It would go so well with plain porridge too. My mom is a good cook too & Thank God I inherited some of her skills too. Hahaha! I'm Teochew but enjoying making Cantonese soups. This salted veg dish goes perfectly well with a bowl of plain rice.